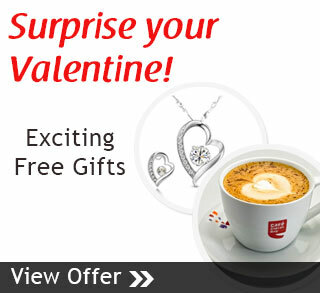 Valentine’s Day is around the corner and we have the perfect surprise for your beloved! What can be more romantic than a hot steamy cup of coffee that sets the tone for romance? Relive the excitement of your first coffee date or confess your love for the first time! And to help you do the same, we have a dual surprise wherein you can also get a beautiful jeweled earing and pendant set for your love.